blogging world by storm not all that long ago, but did you know the brand also has a whole range of moisturizing products? Oh, boy, do they! Read on for the 411. 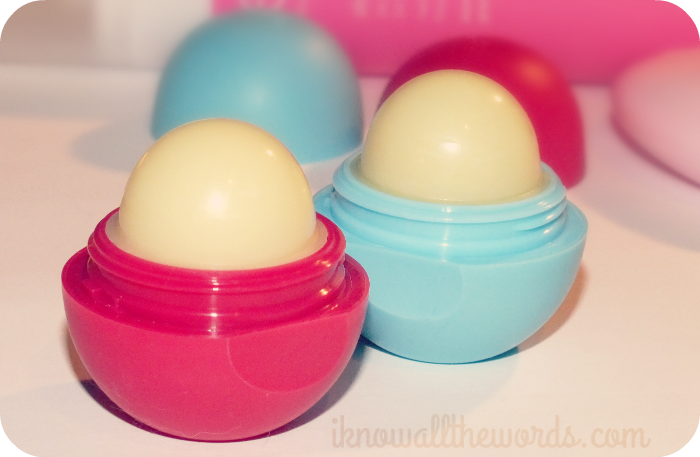 The product that got the ball rolling (pun completely intentional) are the cute- they're so cute, admit it, they are- Smooth Sphere Lip Balms. Since their initial release eos has introduced a host of new scents/flavours with the newest being Blueberry Acai with a sweet blueberry scent upfront and a hint of tart acai to round it out, it smells pretty amazing. Also new-ish to the pack is Pomegranate Raspberry with a sweet and tangy scent that is the perfect blend of the two fruits. 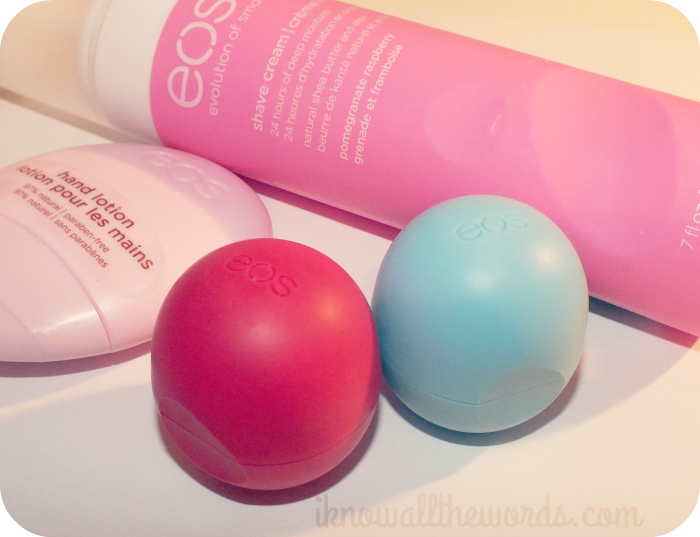 I find that the eos balms apply thinly, because they have a firm texture so it can often be hard to get enough product on for it to be fully moisturizing. That said, I have discovered that if you let the balm warm a moment on your lips (by holding the balm against your lip) it softens just enough to allow you add a thicker layer. While I won't say these are intensely moisturizing, they do hydrate enough to get you through the day with a few touch ups. I like the idea of having hand cream stashed in my purse, but let's face it, it's hard to find 'the one' that can stand up to such a task. For a hand cream to be worthy of valuable purse space it has to be more than just small. It's gotta be leak/spill proof, moisturize well, absorb quickly and cleanly (ie. 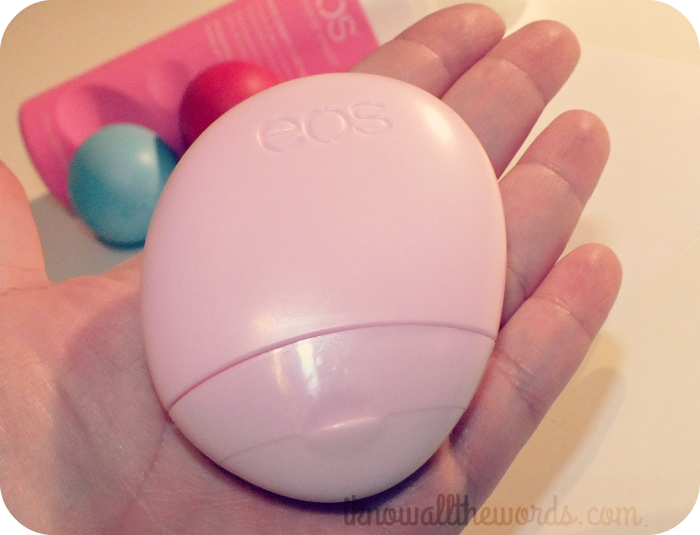 no oil slick feeling left behind) It's a tall order, but eos Everday Hand Lotion pretty much ticks all the boxes! The Berry Blossom scent is lightly sweet and not too floral, but provides a little pick me up type mood booster while you rub this in. It takes just a moment to absorb, but it doesn't leave any sort of residue, so you can get right back to business. 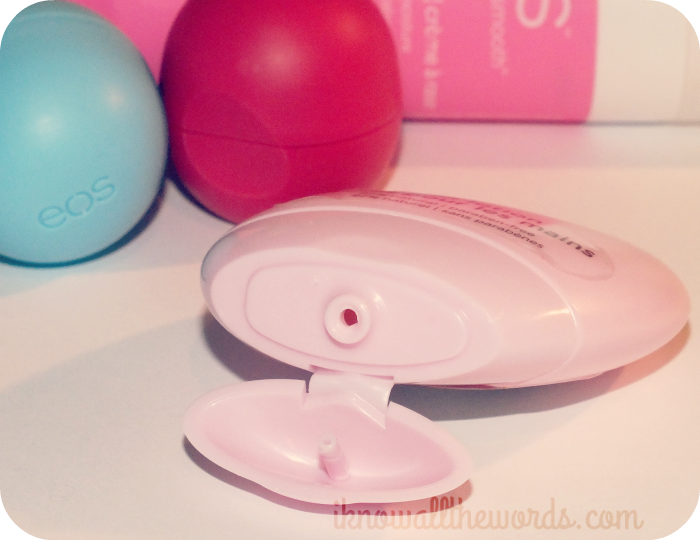 I love the little pod too- so cute! It's slim and compact and my rigorous testing (ie. the ultimate squeeze test) and a ride along in my bag, and so far so good with no leaks or spills. For $1.99 you really can't beat it! When I first started shaving my parents bought me a fancy electric lady shaver, which was great because I really could do no wrong or nick myself. The downside? When it eventually died and I decided to switch to the tried and true basic razor I lacked (and still do if we're being honest) any skill. I did have fun working my way through all the yummy scented shaving creams on the market though. That's basically my first priority when it comes to shaving cream- does it smell good? 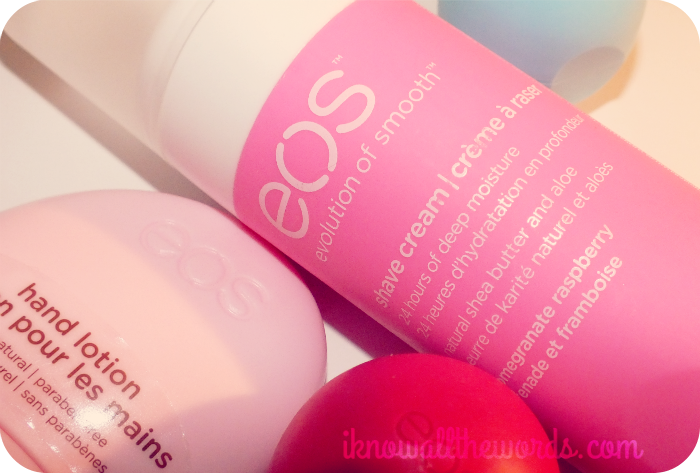 I never thought to put much more effort into than that until using eos Shave Cream. From the first pump it was different. The texture is thick and creamy- like a body lotion- and feels hydrating from the fist application thanks to the shea butter and aloe. I love that this can be used both wet or dry as it means you can get what you need to get done in super speed if need be (and by super speed, I mean in the sink, already half dressed...) The Pomegranate Raspberry scent gives this a lightly sweet and tangy berry scent while you shave, but doesn't really linger on the skin. Added bonus- the plastic tube won't rust and leave a oh-so-unpleasant ring in your shower! 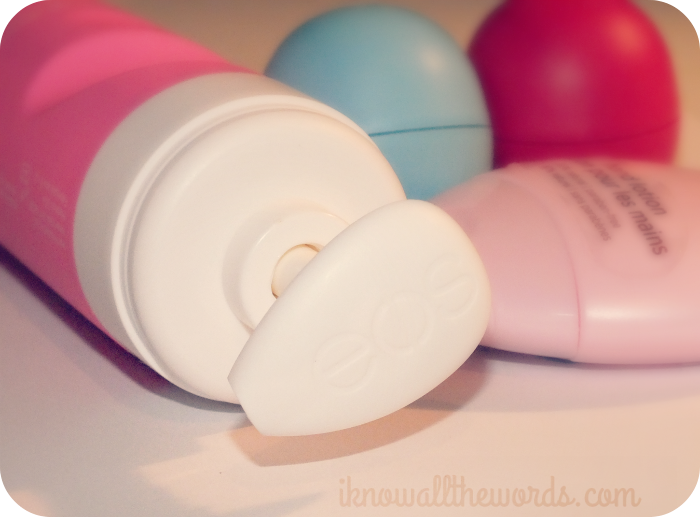 Overall, I am quite impressed with the products in the eos range. Both the hand lotion and shave cream are new favorites and I'm sure I'll be restocking when these run dry. Did I mention the shave cream also comes in a Vanilla Bliss scent? Sign me up for that! 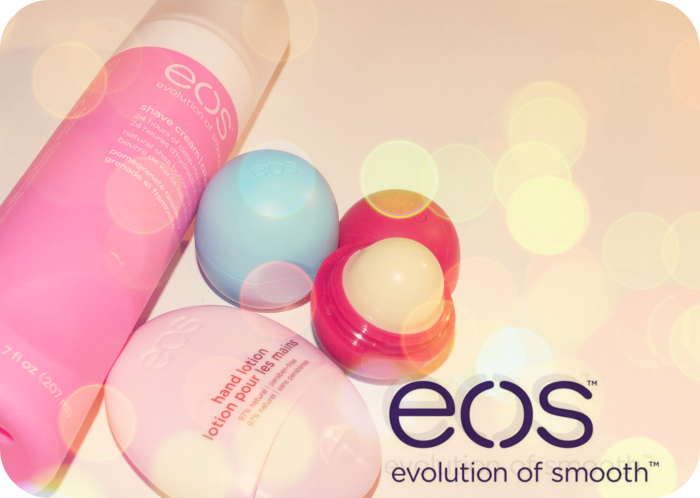 Do you have any eos favourites? Do tell!